The three recipients of the 2010 CJI Judicial Excellence Awards were: Judge W. Terry Ruckriegle, Judge Thomas (Tom) J.B. Reed, and Magistrate Diane Dupree. Judge Ruckriegle, Chief Judge in the 5th Judicial District (Clear Creek, Eagle, Lake and Summit Counties) was the honoree in the District Court Category.Ruckreigle was appointed to the District Court in August 1984 and has presided as Chief Judge since 1994.Ruckriegle is being recognized for his dedication, innovation, volunteerism and leadership.among his many volunteer activities is serving on the Board of Governors and Legislative Policy Committee of the Colorado Bar Association, as the Chief Judges Council liaison for the Division of Planning and Analysis, past president of the Colorado District Judges Association and Colorado Trial Judges Council and on the Board of Directors of the National Judicial College and Colorado Bar Continuing Legal Education Board. The honoree in the County Court Category was Judge Tom Reed of the Boulder County Court.a career in private practice and the Colorado State Public Defenders Office, Judge Reed was appointed Boulder County Judge in 1985 by Governor Richard Lamm.has served as President of the Colorado County Judges Association in 1999/2000, and was one of two original county judges in Boulder County’s DUI Integrated Treatment Court— a specialized treatment court for third and greater DUI offenders.Reed is being honored for his innovative practices, dedication and exemplary judicial demeanor. CJI will also presented the Distinguished Judicial Leadership Award to retiring Chief Justice Mary Mullarkey.Mullarkey has provided outstanding leadership to the Colorado judiciary, overseeing the implementation of technology, encouraging innovation throughout the system, creating a working relationship with the Colorado Legislature, and supporting public education about the judiciary. 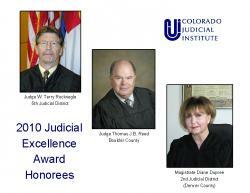 The 2010 Judicial Excellence Awards were presented at the Eighth Annual Judicial Excellence for Colorado Dinner on Thursday, November 18th. 2019 Judicial Excellence Awards Nominations Now Open! The nomination period for the CJI Judicial Excellence Awards is open! Click here to submit a nomination. If you would like to read more about the awards, please visit the Judicial Excellence Awards page. If you cannot use our online form, download a PDF of the form below. ©2008-2018 Colorado Judicial Institute. All Rights Reserved.